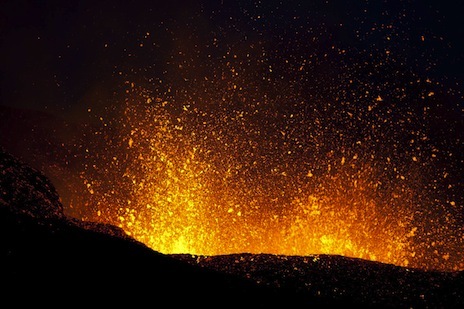 Iceland is renowned for its hot springs, geysers and active volcanoes that erupt from time to time, not world-class oil and gas production – but could basins close to this sparsely populated North Atlantic island be concealing significant hydrocarbon potential? CGGVeritas multi-client seismic database across the Jan Mayen Ridge. A schematic map of the north-east Atlantic, modified from Google Earth, illustrating key regional tectonic elements. The Aegir Ridge and the ridge underlying the Iceland continental margin are all inactive mid-oceanic ridges. Abbreviations: AR=Aegir Ridge, KR=Kolbeinsey Ridge, KnR=Knipovich Ridge, MR=Mohns Ridge, RR=Reyknanes Ridge, EJMFZ=East Jan Mayen Fracture ZI can guess that the one, DSFZ=Denmark Strait Fracture Zone, SFZ= Senja Fracture Zone, WJMFZ=West Jan Mayen Fracture Zone. Photo: Brynjar Gunnarsson, Dreamstime.com The Jan Mayen Ridge, situated some 400 km to the north-east of Iceland, is believed to have the potential for oil and gas accumulations because of its similarity to neighbouring North Atlantic sedimentary basins which are hydrocarbon-bearing. The More, Voring, Faroe-Shetland, Jan Mayen Ridge and East Greenland Basins were previously fused together as part of a continental mass prior to the opening of the North Atlantic Ocean Basin in the Late Palaeocene-Early Eocene. The Ridge is bordered by basalt provinces on both sides. Further to the east lies the Aegir Ridge, a non-active mid-oceanic ridge and, to the west is the Kolbeinsey Ridge, an active mid-oceanic ridge. The microcontinent was formed in two tectonic phases: the opening of the Norway Basin in the Late Palaeocene/Early Eocene, and the rifting and final separation of the microcontinent from the Greenland margin in the Early Miocene. Both tectonic events culminated in the separation of Eurasia and Greenland. The eastern margin of the microcontinent developed as a volcanic passive margin and the western margin as a series of extensional fault blocks. From the northern part of the Jan Mayen Ridge to the south, there is progressive deepening of the basin and an increase in normal faulting and structural complexity. Lundin et al, 1995 and Lundin and Dore, 2002, have established a significant plate re-organisation and change in extension direction during the development of the North Atlantic Ocean Basin. It begins with a sea-floor spreading phase which started during the Early Eocene (Ypresian) with the East Jan Mayen and Senja Fracture zones orientated in a north-west to south-east direction, as can be seen on the map. Between Late Eocene (Priabonian) and Early Oligocene (Rupelian), a northward propagating rift system developed within East Greenland between Liverpool Land and the Jan Mayen microcontinent. The Kolbeinsey Ridge then linked up with the Mohns Ridge through a newly formed fracture zone – the West Jan Mayen Fracture Zone – during Early Miocene (Aquitanian) times, while the previously formed Aegir Ridge became extinct. This resulted in the complete separation of the Jan Mayen microcontinent from East Greenland. The North Atlantic region was then affected by post-break-up compressional events which re-shaped its structural grain. Lundin and Dore, 2002, Blystad et al, 1995, and Vagnes et al, 1998, have illustrated features attributable to the post-break-up compressional events, which include reverse movement of normal faults, broad basin inversion and various forms of stratal folding which occur in the More, Voring and Faroe-Shetland Basins. These features have been observed on the eastern margin of the Jan Mayen microcontinent, especially at the Ridge flank, and the authors propose that they result from ridge-push forces, including sinistral reactivation of pre-existing, deep-seated, north-west trending crustal weaknesses. Interpreted west-east seismic line illustrating key prospective structural targets within the Jan Mayen Ridge. 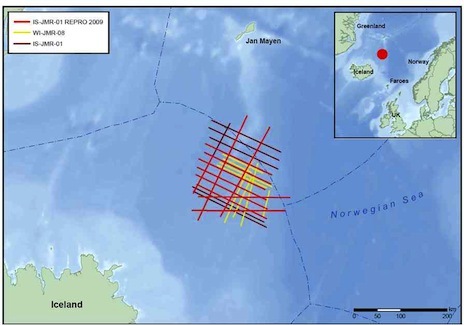 Source: GGGVeritas CGGVeritas has acquired and processed more than 3,600 km of 2D seismic lines over the Jan Mayen Ridge. The dataset was acquired in two phases: Phase 1, IS-JMR-01, consisting of more than 2,700 km of 10 km long-offset 2D seismic lines, was acquired in 2001. Phase 2, IS-JMR-08, with 859 km of long-offset (10.05 km) of 2D, was acquired in 2008 to infill the original 2001 dataset. In 2009, CGGVeritas reprocessed more than 1,700 km of key lines (IS-JMR-01-REPRO) from the 2001 survey, applying the latest techniques such as Fully Ray-Traced Kirchhoff Pre-stack Time Migration. The reprocessed dataset shows significant improvement in fault plane resolution, multiple removal and noise attenuation, enabling better imaging of structures and stratigraphy. 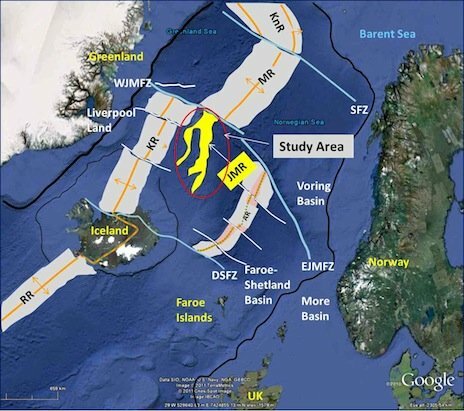 The interpretation of the resulting high-quality dataset has led to a significant improvement in the understanding of this frontier area of the North Atlantic. Four seismic horizons were interpreted across the data area. 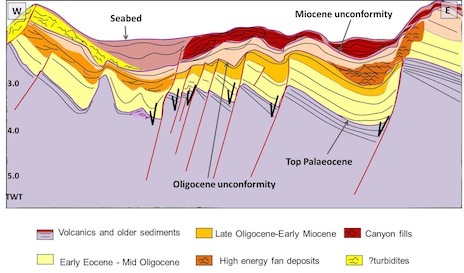 The deepest horizon interpreted is simply identified as Top Palaeocene and may represent the Palaeocene-Eocene boundary. It is widespread over the Jan Mayen Ridge, except where it is obscured by a thick sequence of volcanic rocks. It marks the top of high-amplitude reflections, that have been proven by the Deep-Sea Drilling Programme (DSDP) to comprise basalt and early Palaeogene sediments. The Top Palaeocene horizon is overlain by Sequence 1A: a set of homogenous, low-amplitude, parallel to sub-parallel bedded events. Sequence 1A is overlain by Sequence 1B, a set of parallel to sub-parallel high-amplitude reflections that may represent volcaniclastics and turbidites. Both sequences may have been deposited under low-energy shelf-slope environments. The late Eocene horizon is not widespread across the Ridge. It is named according to published information on key tectonic events that affected the North Atlantic region. It is interpreted on the flanks of the Ridge and truncated on the top by a widespread, younger erosional unconformity. This horizon marks the top of Sequence 1B. It is overlain by Sequence 2, composed of homogenous, transparent and sub-parallel reflections that may represent deposition within more proximal depositional environments than the underlying Sequence 1B. The event marks what may be the end of a major extensional phase in the opening of the North Atlantic Basin. The Early Oligocene horizon is loosely named according to published information and may represent an event related to Eurasian and American plate re-adjustment terminating in local uplift. This erosional event also marks the top of a key compressional event that resulted in the reversal of normal faults adjacent to the Ridge. The horizon is widespread, except on top of the Ridge, where it is truncated by a younger erosional event. It is overlain by Sequence 3, composed of a diverging series of sediments that represent syn-rift deposits within high-energy depositional environments, which were deposited as a result of renewed extension in the region. The late Miocene event is also loosely named, based on published information. The horizon is a key erosional event that is widespread within the mapped area. It is overlain by Sequence 4, which may be composed of variable facies. On the Ridge, the seismic facies are of higher amplitude and may be parallel to sub-parallel, representing deposition under low-energy conditions. On the flanks, deposition is more proximal and reflections are more chaotic and of lower amplitude. The presence of layers of basalt within the Jan Mayen Ridge microcontinent makes imaging below them difficult. However, based on comparison with regional sedimentary basins which are hydrocarbon-bearing and which were formed and modified by similar tectonic processes, the sedimentary rocks are of sufficient thickness and age to potentially generate and store hydrocarbons. A key risk to hydrocarbon generation in this basin is the presence of a mature source rock. The proven source rock for fields in the adjacent basins is Late Jurassic/Early Cretaceous, although there is some hypothesis that younger rocks could generate hydrocarbons within these basins. In the Jan Mayen Ridge, the presence of Late Jurassic/Early Cretaceous rocks has not been confirmed by drilling. However, within the Ridge itself, where imaging is better, there are indications of sedimentary sequences which may pre-date the late Palaeocene/Early Eocene opening of the Norwegian-Greenland Sea and these could offer the needed source potential. In the western rifted margin, key hydrocarbon play elements have been identified on seismic. Possible reservoir rocks may include fluvio-deltaic sediments related to the initial separation of Eurasia and Greenland. Closures on tilted fault blocks within the rift margin could offer potential traps for hydrocarbons. For this play, potential hydrocarbon-sealing candidates have been identified on seismic as argillaceous facies which blanket the titled fault blocks within the rifted margin. These facies were possibly deposited during initial basin subsidence. Additional play potential could be provided by four-way dip closures and reverse faults created by an early Palaeogene compressional event. These structures are present on the Ridge flank, inboard of the passive margin. The reservoir for this target could be provided by turbidites deposited within shelf-slope environments, with sealing provided by intra-formation shales. Migration from the deep-seated mature source rocks (if present) into overlying structures is highly possible through a network of faults and fractures created by rifting and plate re-organisation. However, a key issue on migration, especially on structures adjacent to the Ridge, is timing of hydrocarbon generation and the compressional event, with the risk factor being whether the event has breached the structures, allowing leakage of hydrocarbons. An uninterpreted W-E seismic line illustrating tilted fault blocks related to final separation of the Jan Mayen microcontinent from Greenland (above), with an interpretation of the section with key seismic facies identified (below). Lundin, E and Dore, A.G. (2002). Mid-Cenozoic post-breakup deformation in the ‘passive’ margins bordering the Norwegian-Greenland Sea. Marine and Petroleum Geology 19, pp 79-93. Vagnes, E., Gabrielsen, R.H. and Haremo, P. (1998). Late Cretaceous-Cenozoic intraplate contractional deformation at the Norwegian continental shelf: timing, magnitude and regional implications. Tectonophysics, 300, pp 29-46.